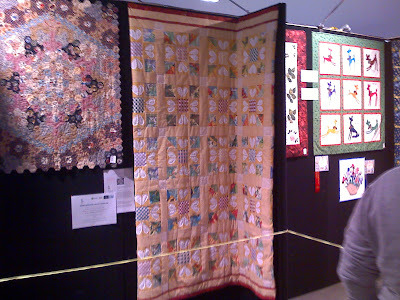 The quilts at the Royal Melbourne Show were absolutely beautiful - hope you got a chance to see them. I've been very inspired for our next quilt after seeing the work on show. These photos are OK left small - but very blurred if you double click on them. 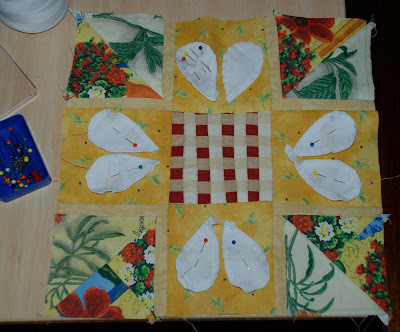 thanks to Barbara Ann, Jane, Deb, Deidre and Jill, we managed to do all the quilting in three weeks! Our "Yellow Flower" quilt is now at the Royal Melbourne Show 2008 - being exhibited in the Craft section, Building 3. Hope you get a chance to see it! The 2008 Show runs from 18th to 28th September. Judging of entries to the craft section will be held tomorrow - thursday 11/09 - and after 18/09 results will be published on the Melbourne show website: www.royalshow.com.au. We can only hope! 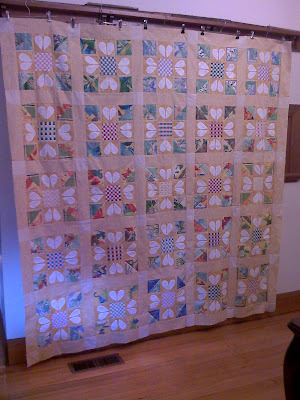 The picture above shows the finished front of our quilt. - More photos soon. Our first project! Friends, neighbours and family members from the Camberwell area, Melbourne (Australia) have all participated in hand sewing "Yellow Flower". The majority of sewers had never done patchwork before, so it is a fantastic result. 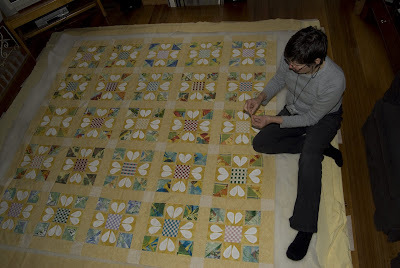 The pattern has evolved slowly from finding a small sample of striped fabric that when sewn in strips look a little like the middle of a daisy, then using the large amount of yellow fabric to carry a daisy colour, adding white petals - and four corners with a mix of green and colours to repeat the centre square colours and suggest leaves. This quilt is sized for a queen-size bed, measuring 2140mm x 2140mm. 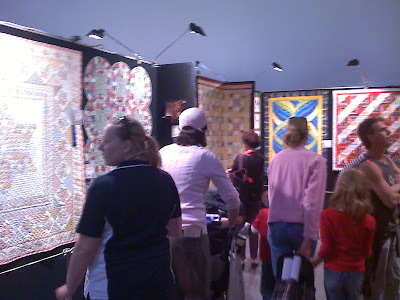 This quilt will be part of the Craft Exhibition at the Royal Melbourne Show 2008. If you would like to purchase raffle tickets for the quilt at $2 a ticket, please email me at amanda@thewilson-s.com, please include your mailing address and number of tickets that you would like to purchase/sell. We will be commencing the raffle mid October 08, tickets butts to be returned by 20th November 08 in time for the draw on Friday 28 November 2008. All proceeds will be donated to the Cancer Council Victoria, you can visit their website at http://www.cancervic.org.au/. Project patchwork was inspired by a group of nurses based in Brisbane, who make approximately 2 quilts per year and have done so for the last nine years to raise money for the cancer community. My family has had a high incidence of cancer, including myself. 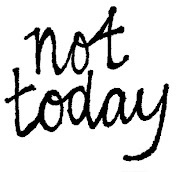 I have had treatment for early stage breast cancer twice, the first time in 2004 and the second time in 2006. I am celebrating having finished treatment and no longer being on the receiving end of the wonderful groups of people who quietly work in the background to support those who have cancer. I have decided to do this by working on a community quilt, like the nurses in Brisbane, that can be raffled to raise money for cancer research with the hope that our kids will benefit. I have worked in the Interior Design Industry for many years and have a huge collection of fabric offcuts, remaining from soft furnishing work and samples. I am inspired to design quilts from an interior designer's perspective - that hopefully will appeal enough for people to buy tickets and enjoy the quilt.